In the Chicago area alone, there are over 300 types of native bees. In addition to this bounty of diversity, there’s also the European honey bee, Apis mellifera, which was introduced by European settlers to the eastern part of North America in the early-1600s. Honey bee colonies eventually went feral and spread throughout the eastern colonies. It wasn’t until the mid-1800s that the honey bee finally made it to western North America. 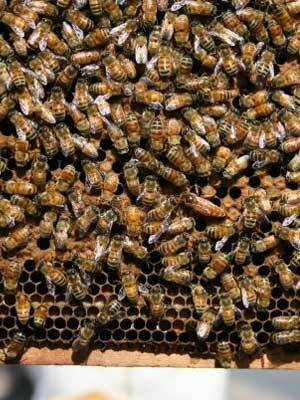 During this time, honey bees became an important part of the U.S. agricultural system. While many native bees and butterflies are important pollinators, they are no match for the honey bee and the sheer volume of pollination that creature can accomplish. 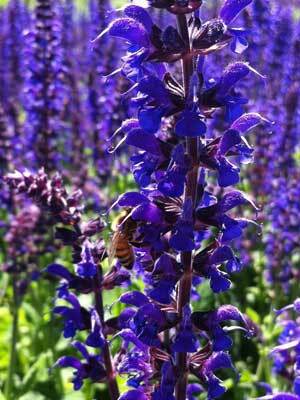 At the height of summer a single hive may contain as many as 50,000 individuals. In contrast, many native bees are solitary creatures. Through sheer number, honey bees are then more productive at pollinating our crops. Today, pollinators like the honey bee are responsible for every third bite of food we eat. For example, we couldn’t grow almonds in California without beekeepers trucking in colonies of bees. If you’ve read about honey bees recently, it’s probably news reports about the rapid decline in their populations and the mystery surrounding the exact cause of colony collapse disorder (CCD). You may have heard about how honey bees are hard hit by pesticides, especially neonictinoids, which have been banned by the European Union for the next two years over worries about the adverse effects to all bee species. Similarly, in the U.S., the Environmental Protection Agency (EPA) is under more intense pressure to regulate these pesticides, as they have recently been sued by commercial beekeepers and environmental groups, which claim that the insecticides clothianidin and thiamethoxam – both neonictinoids – have negative effects on the central nervous systems of honey bees, not to mention other beneficial pollinators. After CCD came to light in 2006, beekeepers across the board noted winter losses that ranged from 30 to 90 percent. While losses fell to 21.9 percent for the winter of 2011/2012 — as bees possibly benefited from what was the fourth warmest winter on record — it still remains true that keeping honey bees alive and healthy is becoming more of a challenge. According to bee experts, most of those winter die-offs aren’t related to CCD, that mysterious ailment in which all the bees weirdly disappear from one’s hive. The vast majority of die-offs have to do with mites, diseases, decreased foraging opportunities from habitat loss, weakened immunity due to generations being exposed to pesticides and poor nutrition, and unfortunately, sometimes, neglectful beekeeping. The United States Department of Agriculture estimates there are between 139,000 and 212,000 beekeepers in the U.S., most of which are hobbyists with 25 hives or fewer. 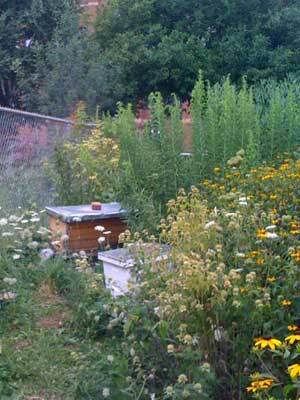 I have a hive in a back yard in Chicago, though not this summer. I went to Washington, D.C. for an internship instead. Most of the beekeepers I know don’t have more than a few hives here and there. But the fact is there are a lot of hobbyist beekeepers, more and more all the time. Chances are, even if you’ve never met me, you’ve seen my honey bees or the honey bees that belong to my fellow beekeepers. Our honey bees have a range of three to five miles from their hive. Our hives are all over the country, on city rooftops, and in suburban backyards. This growing number of beekeepers contributes to the general population of honey bees, which helps fight a general decline in colony numbers. The number of honey bee colonies in the U.S. has decreased from 5 million hives in 1940 to 2.5 million today, even while the demands on our agricultural system increase. That demand is also local now. With the push for a return to local food systems and community gardens, honey bees are being introduced into neighborhoods. This only helps increase the yield of neighborhood gardens. Bees can help produce more and bigger fruits and vegetables. 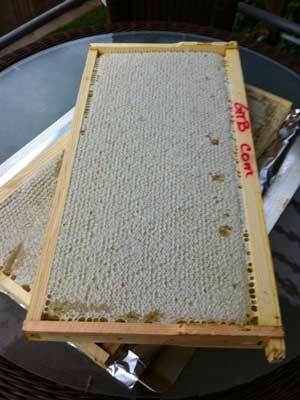 Honey bees are so worth keeping: honey fresh from a hive is a wonderful thing. Eating locally-produced honey will also go a long way to help seasonal allergies. It isn’t hard to be a beekeeper, but it does require a lot of time and attention. There’s a lot to know about honey bees, but they are worth the time as they are endlessly fascinating creatures. Unlike the yellow jacket wasp, the creature honey bees are constantly being mistaken for, honey bees are merely defensive, not aggressive. This is not to say that bee stings don’t hurt — they do — but honey bees would rather collect pollen. They will not bother you if you don’t bother them, they only want to defend their hive and protect their queen. Getting started with backyard beekeeping can be as simple as ordering all the equipment, a package of bees, and just going for it. But finding a beekeeper to learn from, in addition to reading every book you can before you start, is a better option. Find your local beekeeping club and introduce yourself. Beekeepers love talking bees and share stories of tips, triumphs, and tragedies. If you can find a place to volunteer and participate in an inspection before you get your own hive, that’s even better. I had the pleasure of volunteering with Chicago’s Garfield Park Conservatory, where I apprenticed under a number of experienced beekeepers before I finally got my own hive. 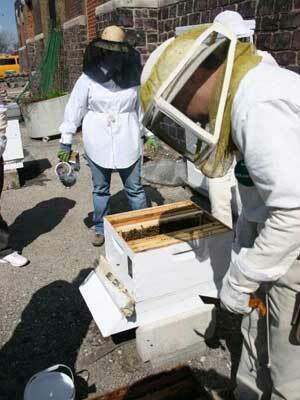 I also took a class with the Chicago Honey Co-op, a fantastic urban apiary that offers beekeeping classes. When you’re ready to become a beekeeper in your own right, check to make sure beekeeping is actually legal in your community. Want to help bees, but don’t really want to own a hive? There are number of things you can do. Fill your garden, patio, window boxes, and balcony with plants that honey bees and other pollinators love. If you have a garden, refrain from using pesticides. Urban and suburban bees may actually be healthier than rural bees because they aren’t subjected to an onslaught of pesticides. If you see a swarm, don’t panic. A swarm is a good thing, the natural reproduction of a colony. Call a beekeeper who will be more than happy to take the swarm out of your tree and off your hands. Please note, a swarm, despite the scary connotations of the name, is actually quite docile. In fact, one of the main challenges for a neighborhood beekeeper is the uninformed community member, whose unfortunate first reaction to seeing a hive is to be afraid. Neighborhood beekeepers generally act as ambassadors for their bees, teaching people and reassuring community members that the honey bee is beneficial and safe. When I inspect my hive, it isn’t uncommon for neighbors to watch and ask questions. 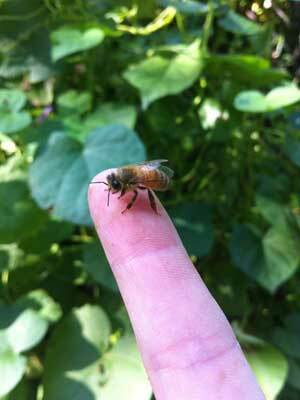 The beekeeping resources I’ve included are those known to me in my hometown of Chicago. If you’re a beekeeper elsewhere and know of great resources in your community, please share them in the comments. Bees happen to be the fırst insects to inhabit our planet ın hıstory and all ınsects (ANTS, TOO) were all theır derivatıves.——-They must have been real precious to jump start cycles of nature. A lovely sentiment, but wildly inaccurate. Bees may be early starters but there is an Order and Class level above the Bee/Ant Sub-Order of Apocrita. I’m a beekeeper and I wonder how many other landscape architects are doing this. There are several great websites and companies to help anyone get started in keeping bees, including tips for design and maintenance of bee yards. If you are interested, reach out to your local beekeeping club. The article mentions urban bees may be healthier because of the absence of pesticides but the downside is that urban bees forage in whatever’s available, including dumpsters and food waste. We need more conscientious urban plant selection to serve all urban insects.